Since its formation, Desert Highway has been captivating and entertaining major audiences. Their critically acclaimed performances are a nonstop journey through numerous radio hits, top ten singles and favorite solo works of The Eagles. Musically and visually, Desert Highway presents a unique edge in performing The Eagles’ varied music catalogue. Desert Highway is a passionate group of six talented professionals, who are studio and concert tour veterans with major recording artists. The band performs live the rich vocal harmonies and intricate guitar styles, without the aid of added pre-recorded tracks. The band is available as a six or nine piece group, with the addition of a full horn section for selected performances. The Eagles are arguably the quintessential American band. They combine influences of both rock and country music into a unique sound that provided the soundtrack to a generation. Since the 1970’s, they have sold more than 120 million albums, earning five U.S. number one singles and six Grammy awards. From the country inspired, ‘Take It Easy’, to the soaring guitar rock anthem, ‘Hotel California’. The list goes on and on, with hits such as ‘Life In The Fast Lane’, ‘Peaceful Easy Feeling’, ‘Heartache Tonight’ and ‘Desperado’. Desert Highway channels the music of this legendary band, and continues to win over both long time and new found fans of all generations. ALL SENIORS (ages 65+) AND BENSALEM RESIDENTS MUST SHOW ID AT THE TICKET GATE TO GAIN ENTRY. NO EXCEPTIONS! NO ID, NO ENTRY! If the correct ticket type was not purchased you will be required to pay the difference in CASH at the ticket booth before being permitted to enter. 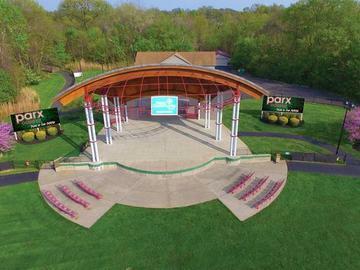 Bensalem Township & The Penn Community Bank Amphitheater reserve the right to cancel any purchases at any time if payment in full is not completed and/or the purchase does not comply with the applicable age and/or geography requirements. In almost all cases we do not cancel concerts in advance due to the threat of inclement weather. Our policy is rain or shine- conditions permitting. This means that we make every attempt to safely get each concert in as planned, as in most cases they cannot be rescheduled. In the chance that we must cancel a show due to weather, we will update via social media (Facebook, Twitter & Instagram), email & our website. NO REFUNDS will be given if a canceled show cannot be rescheduled. NO EXCEPTIONS!